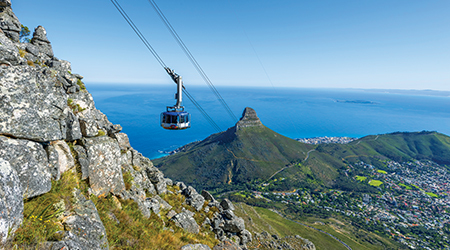 A grand adventure offering insight into well-known destinations across South Africa. The Shongololo Express provides a special experience, accommodating 72 guests in two categories of comfortable en-suite cabins with double or twin beds, and classic wood-panelled carriages. HURRY, OFFER ENDS ON MAY 31ST 2019! Welcome to Africa! We are delighted that you have chosen to visit our beautiful country and we will ensure that the start of your journey with us is a superb experience. You can relax because we are the airport experts and we will get you to where you need to be. Our service to you includes a conversation about your travel arrangements. This is the ideal time for you to ask any questions you may have about your holiday. Bags too heavy? No problem, we can arrange a porter at your request and for your cost. 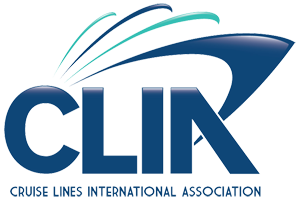 There are many airport facilities available to you. Whatever you need, we'll take you there. Connecting flight, transfer vehicle or car hire? You won't need to stress, we will co-ordinate and assist you to your next service. Even when you have left the airport, our relationship does not end there. Because you have booked our Silver Welcome service, you are guaranteed access to our nationwide emergency backup and support infrastructure. We are with you all the way. This morning you will be collected from your hotel. You drive along the exquisite stretch of coastline known as Millionaire's Paradise - from Clifton to Camps Bay, to the exclusive beach hamlet of Llandudno - towards the charming working harbour of Hout Bay. Embark on an up-close-and-personal Seal Island cruise (optional and own expense). Wind along the legendary Chapman's Peak Drive, hugging the cliffs and relishing the breath-taking ocean views, before visiting the wild and beautiful Cape of Good Hope Section of the Table Mountain National Park, an integral part of the world-renowned Cape Floral Kingdom. After lunch (own account), you meander back along the historical naval port of Simon's Town and the endearing penguin colony at Boulder's Beach, Venture inland to your last stop of the day at Kirstenbosch Botanical Gardens. With the sun setting over the tall peaks of Table Mountain the last rays sparkle on the trees and flowers. 8.00am Check-in at Rovos Rail Lounge, Cape Town Station. 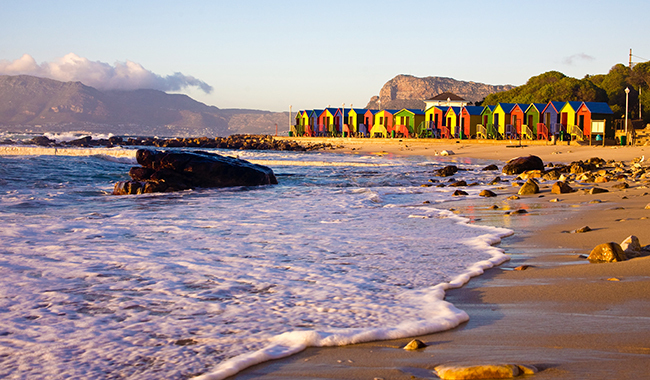 9.00am Full-day tour of Cape Town. 2.30pm Transfer to the train at Cape Town Station. 4.00pm Train departs Cape Town for Worcester. Your city tour commences with a walk through the Company Gardens, followed by a visit to the Bo-Kaap Museum. The first Malays arrived in the Cape as political refugees and slaves during the 17th century. Nearly two centuries after emancipation, these Islamic people moved into the area known today as the Bo-Kaap, building mosques with picturesque minarets and their own Georgian-style houses with Dutch influence. One of the oldest Cape Town buildings houses the museum which is furnished as a Muslim house of the 19th century and documents the history of the Cape Malays. On your way to the Victoria &amp; Alfred Waterfront, you will stop at Diamond Works, where you will follow a tour of the diamond cutting studio, a jewellery manufacturing workshop, a jewellery design studio as well as a gemmological laboratory. Your lunch stop will be at the Victoria &amp; Alfred Waterfront, a development that has brought new life to the old harbour of the Dutch East India Company in Table Bay. The complex offers shops, craft markets, restaurants, taverns, cinemas, theatres as well as great views over the harbour. In the afternoon, you will drive through District Six, named the Sixth Municipal District of Cape Town in 1867. Originally established as a mixed community of freed slaves, merchants, artisans, labourers and immigrants, District Six was a vibrant centre with close links to the city and the port. By the beginning of the 20th century, however, the process of removals and marginalisation had begun. The first to be forced out were Black South Africans who were displaced from the District in 1901. As the more prosperous moved away to the suburbs, the area became a neglected ward of the city. On 11 February 1966 it was declared a white area under the Group Areas Act of 1950, and by 1982, the life of the community was over. More than 60 000 people were forcibly removed to barren outlying areas aptly known as the Cape Flats, and their houses in District Six were flattened by bulldozers. The District Six Museum, established in December 1994, works with the memories of the District Six experience and with that of forced removals more generally. You will end your city tour with a visit to the Castle of Good Hope, the oldest surviving building in South Africa. This pentagonal fortification replaced a small clay and timber fort built by Commander Jan van Riebeeck in 1652 as a maritime replenishment station for the ships of the Dutch East India Company. The stone walls between the bastions are 150m long and 12m high. Distance travelled: appx. 90km. 9.00am Drive the scenic route to Hermanus (120km). 4.00pm Return to train at Robertson and depart for Voorbaai for the overnight stop. Optional: Golfers can play at Arabella (100km). You will travel over the Rooihoogte and Floorshoogte passes via the Overberg towns of Villiersdorp and Botrivier to Hermanus, once a renowned fish market and whaling station. The whale hunts were stopped by international treaty in 1935. The WWF includes Hermanus in its list of 12 best whale-viewing sites in the world, but it tops the list when it comes to land-based whale watching from the town's natural cliffs and in season (normally between July and November) whales can be seen from as close as 5 metres away. 9.00am Transfer to Knysna with a lagoon ferry ride to Featherbed Nature Reserve OR enjoy shopping. 6.30pm Dinner at Fancourt Golf Estate. Overnight George. 9.00am Transfer to Ernie Els Oubaai Golf Club for tee off. Return to train in the late afternoon. Drive along the coast from George, situated in the heart of the Garden Route. The town itself sits on a 10km plateau between the majestic Outeniqua Mountains to the north and the Indian Ocean to the south. You will drive along the scenic Old Passes Route to Knysna, winding through the primeval forest of the Homtini, lying between lush forests and a peaceful lagoon. The Knysna Heads -- two sandstone cliffs guarding the mouth of the lagoon connecting the estuary with the sea -- is a dramatic viewpoint. Enjoy a lagoon ferry ride to the Featherbed Nature Reserve. Optional shopping at leisure. Distance travelled: appx. 180km. 9.00am Drive the Outeniqua Pass to visit the Cango Caves. Afternoon visit to an ostrich farm. 3.30pm Board train in Oudtshoorn. Depart for Graaff Reinet. 9.00am Tee off at Fancourt Golf Estate. 2.00pm Drive the Outeniqua Pass to Oudtshoorn. Surrounded by the natural beauty of this semi-desert region, Oudtshoorn is situated at the foot of the majestic Swartberg Mountain Range. Many rivers, streams and falls have their origins in the Swartberg, Outeniqua and Kammanassie mountains that surround the town. Oudtshoorn is regarded as the centre of the Klein Karoo and is world-renowned for its Cango Caves and the breeding of ostriches. The great natural wonder of the Cango Caves has a series of colourful underground chambers with breathtaking limestone formations. Oudtshoorn is famous for feathering the world in the time of the boa and grand hats. The ostrich boom of the early 20th century turned out many millionaires who, in turn, created elaborate lifestyles in this remote part of Africa. 9.00am Enjoy a guided walking tour of Graaff Reinet. 11.00am Return to train and depart for Kimberley. Tucked into the bend of the Sundays River, the Karoo town of Graaff Reinet was established in 1786 and is the fourth oldest settlement in South Africa. It's a stylish town with at least 200 historical buildings, restored pre-Victorian homes in almost every street and a collection of museums and galleries celebrating its past. 9.00am Visit to the Big Hole and Diamond Museum. Afternoon visit to the William Humphreys Art Gallery and McGregor Museum. 5.00pm Return to train and depart for Bloemfontein. 9.00am Tee off at Kimberley Golf Club. 5.00pm Return to train and depart for Bloemfontein for the overnight stop. Capital of the Northern Cape, Kimberley is well known for the discovery of diamonds which led to its establishment in 1893. Highlights of the day include a visit to the Big Hole Diamond Mine Museum, followed by a lunch break at one of the restaurants in the city. After lunch, you will visit the William Humphreys Art Gallery and the McGregor House Museum. Distance travelled: appx. 162km. 9.00am Morning tour of Bloemfontein including the Women's Memorial and Anglo Boer Museum. 11.00am Return to train and depart for Ladysmith. 1.00pm Enjoy lunch on board. Bloemfontein is the seat of the South African judicial system. At the end of the 19th century it was also the capital of the old Boer Republic of The Orange Free State. Visit the Women's Memorial at the Anglo Boer War Museum. This monument is a reminder of life in the concentration camps and commemorates the 27 000 women and children who died in these camps. The Museum itself is a graphic depiction of the hardship endured by all during the war and relates the history of South Africa from 1652. You will then take an orientation drive through Bloemfontein, capital of the Free State Province and also known as the Rose City. Your lunch stop is at the Loch Logan Waterfront, next to the city's newly renovated stadium, one of the venues during the 2010 Soccer World Cup. In the afternoon, you will drive up to Naval Hill which presents several beautiful panoramic views of the city. We end the day at the former State President's residence "Olivenhuis", which now houses an extensive collection of South African art. The gardens offer a relaxing atmosphere to round off the day before returning to the train. Distance travelled: appx. 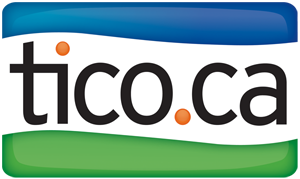 50km. 9.00am Battlefields tour taking in the Siege Museum and Wagon Hill. 12.30pm Return to train for lunch and depart for Durban. 7.00am One-hour transfer from Ladysmith Station to Champagne Sports Resort for tee off. 1.00pm Return to train for lunch and depart for Durban. Trace the course of the Anglo Boer Wars at the Siege Museum in Ladysmith. Wagon Hill is where both the South Africans and British suffered heavy losses and was subsequently declared a National Monument in 1938. Britain marched into the South African war in the spring of 1899, confident that it "would all be over by Christmas!" The war lasted three years and was to become the most costly Britain had ever fought. Distance travelled: appx. 180km. 9.00am Disembark in Durban for a cultural visit to PheZulu Safari Village and uShaka Marine World. 4.00pm Return to train and depart for Empangeni. 9.00am Tee off at Durban Country Club. 4.00pm Return to train and depart for Empangeni for the overnight stop. Durban is the third largest city of South Africa and enjoys great importance due to its industry and its very large port. Thanks to the subtropical climate and the long stretches of beautiful beaches, large numbers of inlanders retreat to Durban in winter. An orientation tour of the city will allow you to see a very good mix of old and new, East and West with a touch of Africa. Visit PheZulu Safari Village and feel the rhythm of Africa. Enjoy uShaka Marine World, Africa's largest marine theme park, where you can have lunch and spend your afternoon. Distance travelled: appx. 50km. Durban is the third largest city of South Africa and enjoys great importance due to its industry and its very large port. Thanks to the subtropical climate and the long stretches of beautiful beaches, large numbers of inlanders retreat to Durban in winter. An orientation tour of the city will allow you to see a very good mix of old and new, East and West with a touch of Africa. Visit PheZulu Safari Village and feel the rhythm of Africa. Enjoy uShaka Marine World, Africa's largest marine theme park, where you can have lunch and spend your afternoon. Distance travelled: appx. 50 km. 6.30am Early morning and afternoon game drives in Hluhluwe-Imfolozi Park. 3.00pm Board train and depart for Mpaka, Swaziland, where border formalities take place. 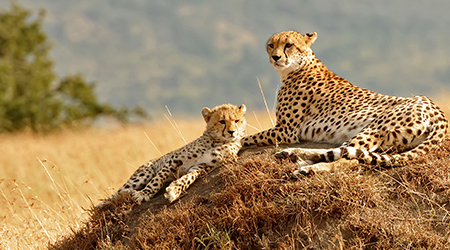 As the oldest proclaimed nature reserve in Africa, Hluhluwe consists 960 square kilometres (96 000ha) of hilly topography 280km north of Durban in central Zululand and is known for its rich wildlife and conservation efforts. The park is the only state-run park in KwaZulu-Natal where all the Big Five game animals occur. Due to conservation efforts, the park now has the largest population of white rhino in the world. It is also one of the world's top spots for viewing Nyala and is a prime birding destination for 340 species. Distance travelled: appx. 250km. 8.00am One-hour transfer to Nkonyeni Golf Estate for tee off. 4.00pm After border formalities at Jeppes Reef, rejoin the train in Malelane. The tiny Kingdom of Swaziland covers only 17 000 square kilometres, making it the second smallest country in Africa. The day's tour will commence from Mpaka, driving through the Ezulwini Valley passing the Ludzidzini Royal residence, stopping at Swazi Candles and Manzini where guests experience the Swazi market: a hive of activity displaying a wide variety of skilfully crafted woodcarvings, colourful textiles and superb basketwork for which Swazis are renowned. After a visit to the capital city Mbabane enjoy a lunch stop at Mantenga Lodge with an afternoon visit to the Ngwenya Glass Complex. Distance travelled: appx. 280km. 6.30am Full-day game drive in the Kruger Park. 5.00pm Rejoin train in Malelane. 9.00am Tee off at Leopard Creek, Nelspruit or White River. The world-renowned Kruger National Park has 2-million hectares of unrivalled in diversity of life forms. It is a world leader in advanced environmental management techniques and home to an impressive number of species, e.g. 336 species of trees, 49 species of fish, 34 species of amphibians, 114 species of reptiles, 507 species of birds and 147 species of mammals including the Big Five. Distance travelled: appx. 220km. 10.00am Arrive at Rovos Rail Station, Pretoria. Check out of train. Luggage will be stored at the station. 11.00am Tour of Pretoria and Soweto. 6.00pm Return to Rovos Rail Station. Tour ends. Soweto comprises one-million people and was made famous by the Apartheid laws. You will pass the Chris Hani Baragwanath Hospital (the largest hospital in the Southern Hemisphere) and also drive past the only street in Africa that once housed two Nobel Peace laureates, Archbishop Desmond Tutu and Nelson Mandela. After that, you will also visit the Hector Petersen Memorial, named after one of the first students to be killed in the 1976 uprising against the Apartheid government. You will spend the afternoon in Pretoria, the administrative capital of South Africa, visiting the Union Buildings. Designed by the famous colonial English architect, Sir Herbert Baker, and completed in 1913, the Union Buildings house the offices of the President and Ministers. Before leaving the capital behind, you will visit the Voortrekker Monument that commemorates the 'Great Trek' of the 1830s. Distance travelled: appx. 265km. Price is per person based on twin/double, subject to availability and current exchange rates. Pricing reflects discount which may include an advance booking of 40-55 days . Savings listed are the total savings based on two people (twin/double). Airline taxes, if applicable, are included. Please enquire about departures from other cities, single supplements, extensions or upgrades. Please visit trip page for full terms and conditions. 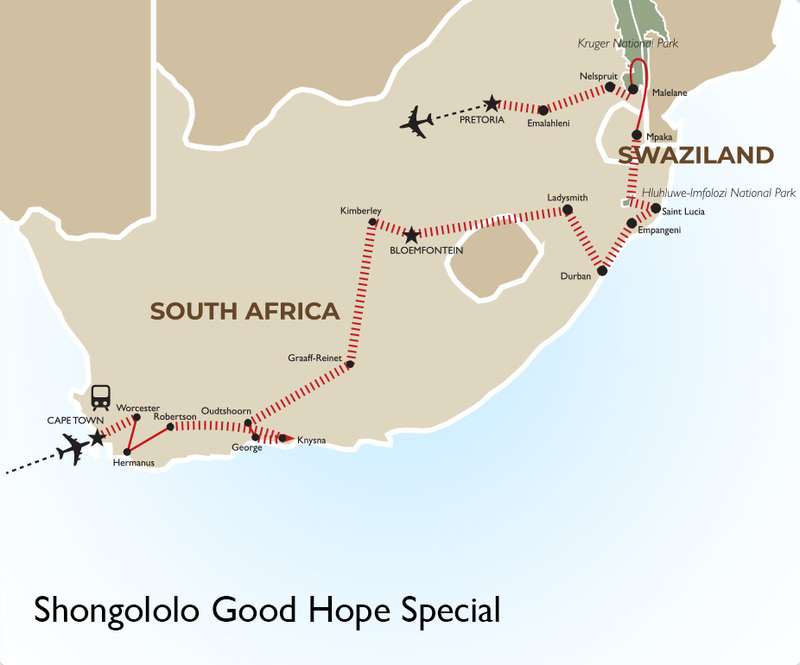 Interested in SAVE $1550 on the Shongololo Good Hope Special with Goway?